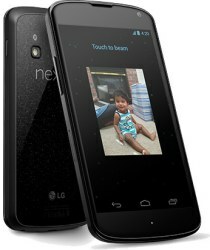 LG's Google Nexus 4 delivers the very latest from Android with v4.2 on board. With Google working on this phone you can be assured of a slick user experience. This phone is packing a super powerful quad-core processor as well as 2GB RAM giving impressive usability and multitasking. The 4.7 inch touchscreen is a true HD display with a resolution of 768x1280 pixels, delivering superb quality when web browsing or watching movies. Google Chrome, Gmail and Google Maps are all pre-loaded and the Google Play store is on hand for the latest new apps. The phone supports all popular messaging formats and includes Gesture Typing that allows you to glide your finger over the letters for easy messaging. The 8 megapixel camera includes Panorama 360 degree shot that allows you to take multiple shots in any direction and they are stitched together for impressive detail. The camera can record video clips in 1080p and with continuous focus and time lapse mode you can create fantastic videos. The phone includes 3.5G, Wi-Fi, Bluetooth and NFC as well as wireless charging and there is a multimedia player and document viewer on board too. Social network integration puts the latest wall updates and tweets at your fingertips and the TV Out connection allows you to share your photos and videos on your big TV screen at home. The powerful processor, large display and latest Google features give the LG Google Nexus 4 a powerful all round set of features making this a great choice for your next smartphone.